Watch your favourite video songs and movies in video player. It supports MPEG4, H.263, WMV file types. Built-in GPS and optional TeleNav app. 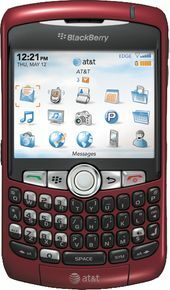 The RIM BlackBerry Curve 8310 adds GPS capabilities to the already impressive and sleek messaging smartphone. You also get a 2-megapixel camera, Bluetooth, and good call quality. The Curve 8310 doesn't offer Wi-Fi or 3G support. The Web browser isn't the sleekest, and the camera lacks video-recording capabilities. Also, unlike the T-Mobile version, you only get the proprietary BlackBerry Messenger IM client. The Curve 8310 doesn't offer Wi-Fi or 3G support. The Web browser isn't the sleekest, and the camera lacks video-recording capabilities. Also, unlike the T-Mobile version, you get only the proprietary BlackBerry Messenger IM client.